Another great success for the ICN natural bodybuilding organisation in South Australia. This DVD presents every round of competition through to the awards and overall presentations. 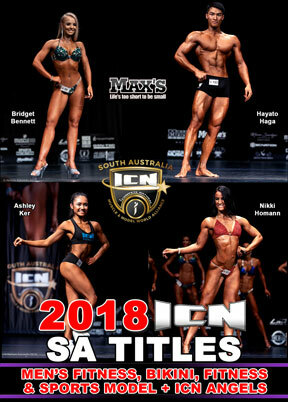 2018 ICN South Australia Natural Fitness, Bikini & Sports Model Titles. Norwood Town Hall, South Australia, September 9th, 2018. The 2018 ICN South Australia Titles Bikini, Models & Fitness Show was the second of 2 events held at Norwood on September 9th. Professionally run by Kim Tanska and his team, this event was another great success for the ICN organisation in South Australia. This DVD presents every round of competition through to the awards and overall presentations. The Major Sponsor was MAX’S.